Anaphylaxis presenting as bronchospasm, hypotension, syncope, urticaria, and/or angioedema of the throat or tongue, has been reported to occur after administration of XOLAIR. Anaphylaxis has occurred as early as after the first dose of XOLAIR, but also has occurred beyond 1 year after beginning regularly administered treatment. Because of the risk of anaphylaxis, observe patients closely for an appropriate period of time after XOLAIR administration. Health care providers administering XOLAIR should be prepared to manage anaphylaxis that can be life-threatening. Inform patients of the signs and symptoms of anaphylaxis and instruct them to seek immediate medical care should symptoms occur [see Warnings and Precautions (5.1) and Adverse Reactions (6.1, 6.3)]. These highlights do not include all the information needed to use XOLAIR safely and effectively. See full prescribing information for XOLAIR. XOLAIR is indicated for patients 6 years of age and older with moderate to severe persistent asthma who have a positive skin test or in vitro reactivity to a perennial aeroallergen and whose symptoms are inadequately controlled with inhaled corticosteroids. XOLAIR has been shown to decrease the incidence of asthma exacerbations in these patients. XOLAIR is not indicated for treatment of other allergic conditions. XOLAIR is indicated for the treatment of adults and adolescents 12 years of age and older with chronic idiopathic urticaria who remain symptomatic despite H1 antihistamine treatment. XOLAIR is not indicated for treatment of other forms of urticaria. Administer XOLAIR 75 mg to 375 mg by subcutaneous injection every 2 or 4 weeks. 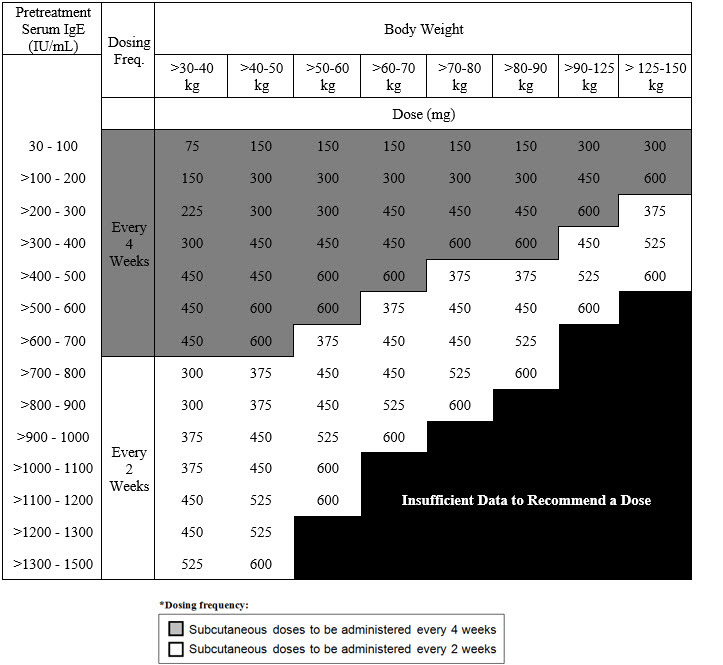 Determine dose (mg) and dosing frequency by serum total IgE level (IU/mL) measured before the start of treatment, and by body weight (kg). Adjust doses for significant changes in body weight during treatment (see Tables 1 and 2). Total IgE levels are elevated during treatment and remain elevated for up to one year after the discontinuation of treatment. Therefore, re-testing of IgE levels during XOLAIR treatment cannot be used as a guide for dose determination. Interruptions lasting less than one year: Dose based on serum IgE levels obtained at the initial dose determination. Interruptions lasting one year or more: Re-test total serum IgE levels for dose determination using Table 1 or 2, based on the patient's age. Periodically reassess the need for continued therapy based upon the patient's disease severity and level of asthma control. Adult and adolescent patients 12 years of age and older: Initiate dosing according to Table 1. Pediatric patients 6 to <12 years of age: Initiate dosing according to Table 2. Administer XOLAIR 150 mg or 300 mg by subcutaneous injection every 4 weeks. Dosing of XOLAIR in CIU patients is not dependent on serum IgE (free or total) level or body weight. The appropriate duration of therapy for CIU has not been evaluated. Periodically reassess the need for continued therapy. XOLAIR is available as a prefilled syringe and as a lyophilized powder in vial for reconstitution. Both XOLAIR prefilled syringe and lyophilized powder should be administered by a healthcare professional. Administer XOLAIR by subcutaneous injection. The injection may take 5-10 seconds to administer. Do not administer more than one injection per site. (Table 3, Table 4). All doses in the table are approved for use in asthma patients. The 150 mg and 300 mg XOLAIR doses are also approved for use in CIU patients. To prepare XOLAIR prefilled syringes for subcutaneous administration, please carefully read and adhere to these instructions for use. XOLAIR prefilled syringes are available in 2 dose strengths. These instructions are to be used for both dose strengths. You should check the label on the carton that comes with the XOLAIR prefilled syringe to make sure that the dose is correct. 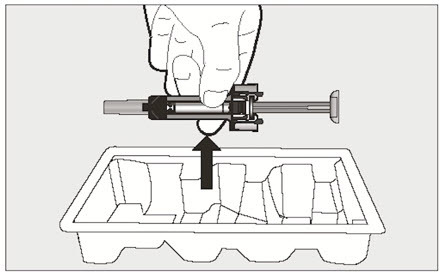 Keep the unused syringe in the original carton and store the carton in a refrigerator at 36˚F to 46˚F (2˚C to 8˚C). Do not remove the syringe from its original carton during storage. Keep the XOLAIR syringe out of direct sunlight. Do not use if the syringe has been frozen. Always keep the syringe dry. 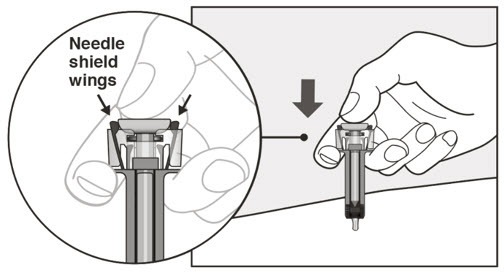 The removable needle cap of XOLAIR solution for injection in prefilled syringe contains a derivative of natural rubber latex [see Description (11)]. Do not open the sealed outer carton until you are ready to inject XOLAIR. Do not take the needle cap off until you are ready to inject XOLAIR. Do not try to take the syringe apart at any time. Do not use if the syringe has been dropped or damaged. Do not use if the packaging is damaged or appears to be tampered with. Do not leave the syringe unattended. Find a clean, flat, working surface. Each XOLAIR carton contains 1 syringe. Take the carton containing the syringe out of the refrigerator. Check the expiration date on the XOLAIR carton. Do not use it if the expiration date has passed because it may not be safe to use. If the expiration date has passed, safely dispose of the syringe in a sharps container (see step 14 at the end of these instructions for use). 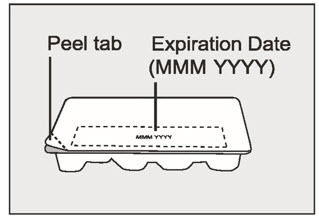 Place the carton on a clean flat, surface. Set aside the carton for at least 15-30 minutes so the syringe can warm up on its own to room temperature (leave the syringe in the carton to protect it from light). If the syringe does not reach room temperature, this could cause the injection to feel uncomfortable and make it hard to push the plunger. Do not allow the syringe to become hot. Do not speed up the warming process in any way, and do not put the syringe in a microwave or in warm water. Take the blister pack out of the carton. Check the expiration date on blister pack. Be careful when taking out the syringe. Do not flip the blister pack upside down to take out the syringe, and do not touch the back of the syringe. This may damage the syringe. Peel off the blister pack cover. Take the syringe out of the blister pack by holding the middle part of the syringe. When holding the syringe, make sure you always hold the syringe as shown. Do not handle the syringe by holding the plunger or needle cap. Check the syringe. The liquid in the syringe should be clear to slightly opalescent and colorless to pale brownish-yellow. Do not use the syringe if the liquid is cloudy, discolored, or contains foreign particles. Check the expiration date on the syringe. Do not use the syringe if the expiration date has passed because it may not be safe to use. If the medicine does not look as described or if the expiration date has passed, safely dispose of the syringe in a sharps container (see step 14 at the end of these instructions for use). 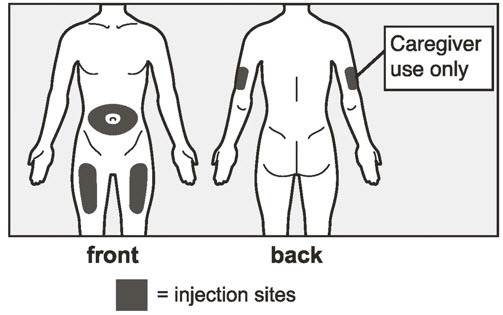 The recommended injection sites are the upper arm and the front and middle of the thighs. Do not inject into moles, scars, bruises, or areas where the skin is tender, red, hard, or if there are breaks in the skin. Choose a different injection site for each new injection at least 1 inch from the area used for the last injection. 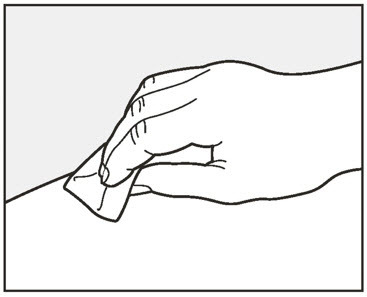 Wipe the injection site with an alcohol pad in a circular motion and let it air dry for 10 seconds. Do not fan or blow on the cleaned area. Hold the syringe firmly with 1 hand and pull the needle cap straight off with your other hand. Do not hold the plunger while you remove the needle cap. Do not touch the needle after removing the needle cap. Throw away the needle cap in a sharps container right away. There may be a small air bubble in the syringe. This is normal and you should not try to remove the air bubble. You may also see a drop of liquid at the end of the needle. This is also normal and will not affect the dose. Use your other hand and gently pinch the area of skin that was cleaned. Hold the pinched skin tight. Pinching the skin is important to make sure that you inject under the skin (into the fatty area) but not any deeper (into muscle). 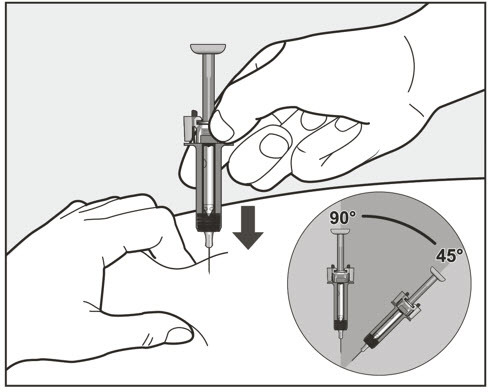 Continue holding the syringe by the center and use a quick, dart-like motion to insert the needle all the way into the pinched skin at an angle between 45° to 90°. It is important to use the correct angle to make sure the medicine is delivered under the skin (into the fatty area), or the injection could be uncomfortable and the medicine may not work. Do not touch the plunger while inserting the needle into the skin. Do not insert the needle through clothing. 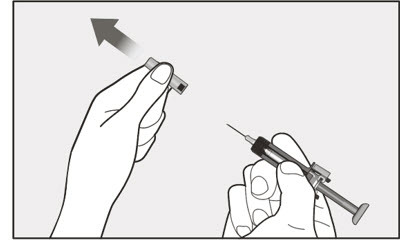 Once the needle is inserted, hold the syringe tightly in place and do not change the angle of injection or insert the needle again. The patient should not move and should avoid sudden movements throughout the injection. Slowly inject all of the medicine by gently pushing the plunger all the way down. You must press the plunger all the way down to make sure that the full dose of medicine gets injected. 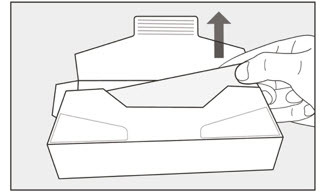 If the plunger is not fully pressed, the needle shield will not extend to cover the needle when it is removed. Gently release the plunger and allow the needle to be covered by the needle-shield. 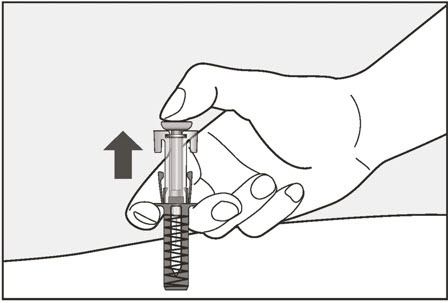 If the needle is not covered, proceed carefully to dispose of the syringe (see step 14 at the end of these instructions for use). In case of skin contact with medicine, wash the area that touched the medicine with water. 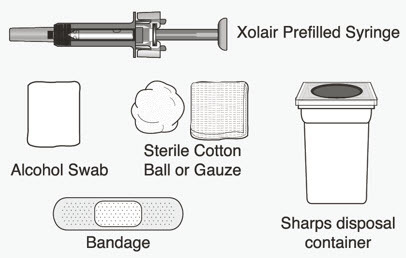 The XOLAIR prefilled syringe is a single-dose syringe and should not be used again. Put the used XOLAIR prefilled syringe in a FDA-cleared sharps disposal container right away after use. Do not throw away (dispose of) the prefilled syringe in the trash. Before reconstitution, determine the number of vials that will need to be reconstituted (each vial delivers 150 mg of XOLAIR in 1.2 mL) (see Table 4) . 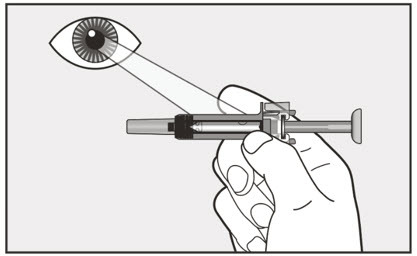 Draw 1.4 mL of SWFI, USP, into a 3 mL syringe equipped with a 1-inch, 18-gauge needle. Place the vial upright on a flat surface and using standard aseptic technique, insert the needle and inject the SWFI, USP, directly onto the product. Keeping the vial upright, gently swirl the upright vial for approximately 1 minute to evenly wet the powder. Do not shake. Gently swirl the vial for 5 to 10 seconds approximately every 5 minutes in order to dissolve any remaining solids. The lyophilized product takes 15 to 20 minutes to dissolve. If it takes longer than 20 minutes to dissolve completely, gently swirl the vial for 5 to 10 seconds approximately every 5 minutes until there are no visible gel-like particles in the solution. Do not use if the contents of the vial do not dissolve completely by 40 minutes. After reconstitution, XOLAIR solution is somewhat viscous and will appear clear or slightly opalescent. It is acceptable if there are a few small bubbles or foam around the edge of the vial; there should be no visible gel-like particles in the reconstituted solution. Do not use if foreign particles are present. Invert the vial for 15 seconds in order to allow the solution to drain toward the stopper. Use the XOLAIR solution within 8 hours following reconstitution when stored in the vial at 2ºC to 8ºC (36ºF to 46ºF), or within 4 hours of reconstitution when stored at room temperature. Reconstituted XOLAIR vials should be protected from sunlight. Using a new 3 mL syringe equipped with a 1-inch, 18-gauge needle, insert the needle into the inverted vial. Position the needle tip at the very bottom of the solution in the vial stopper when drawing the solution into the syringe. The reconstituted product is somewhat viscous. Withdraw all of the product from the vial before expelling any air or excess solution from the syringe. Before removing the needle from the vial, pull the plunger all the way back to the end of the syringe barrel in order to remove all of the solution from the inverted vial. Replace the 18-gauge needle with a 25-gauge needle for subcutaneous injection. Administer XOLAIR by subcutaneous injection. The injection may take 5-10 seconds to administer because the solution is slightly viscous. Do not administer more than 150 mg (contents of one vial) per injection site. Divide doses of more than 150 mg among two or more injection sites. For injection: 150 mg white lyophilized powder in a single-dose vial for reconstitution. Severe hypersensitivity reaction to XOLAIR or any ingredient of XOLAIR [see Warnings and Precautions (5.1)]. Anaphylaxis has been reported to occur after administration of XOLAIR in premarketing clinical trials and in postmarketing spontaneous reports [see Boxed Warning and Adverse Reactions (6.3)]. Signs and symptoms in these reported cases have included bronchospasm, hypotension, syncope, urticaria, and/or angioedema of the throat or tongue. Some of these events have been life-threatening. In premarketing clinical trials in patients with asthma, anaphylaxis was reported in 3 of 3507 (0.1%) patients. Anaphylaxis occurred with the first dose of XOLAIR in two patients and with the fourth dose in one patient. The time to onset of anaphylaxis was 90 minutes after administration in two patients and 2 hours after administration in one patient. A case-control study showed that, among XOLAIR users, patients with a history of anaphylaxis to foods, medications, or other causes were at increased risk of anaphylaxis associated with XOLAIR, compared to those with no prior history of anaphylaxis [see Adverse Reactions (6.1)]. In postmarketing spontaneous reports, the frequency of anaphylaxis attributed to XOLAIR use was estimated to be at least 0.2% of patients based on an estimated exposure of about 57,300 patients from June 2003 through December 2006. Anaphylaxis has occurred as early as after the first dose of XOLAIR, but also has occurred beyond one year after beginning regularly scheduled treatment. Administer XOLAIR only in a healthcare setting by healthcare providers prepared to manage anaphylaxis that can be life-threatening. Observe patients closely for an appropriate period of time after administration of XOLAIR, taking into account the time to onset of anaphylaxis seen in premarketing clinical trials and postmarketing spontaneous reports [see Adverse Reactions (6)]. Inform patients of the signs and symptoms of anaphylaxis, and instruct them to seek immediate medical care should signs or symptoms occur. Discontinue XOLAIR in patients who experience a severe hypersensitivity reaction [see Contraindications (4)]. Malignant neoplasms were observed in 20 of 4127 (0.5%) XOLAIR-treated patients compared with 5 of 2236 (0.2%) control patients in clinical studies of adults and adolescents ≥12 years of age with asthma and other allergic disorders. The observed malignancies in XOLAIR-treated patients were a variety of types, with breast, non-melanoma skin, prostate, melanoma, and parotid occurring more than once, and five other types occurring once each. The majority of patients were observed for less than 1 year. The impact of longer exposure to XOLAIR or use in patients at higher risk for malignancy (e.g., elderly, current smokers) is not known. In a subsequent observational study of 5007 XOLAIR-treated and 2829 non-XOLAIR-treated adolescent and adult patients with moderate to severe persistent asthma and a positive skin test reaction or in vitro reactivity to a perennial aeroallergen, patients were followed for up to 5 years. In this study, the incidence rates of primary malignancies (per 1000 patient years) were similar among XOLAIR-treated (12.3) and non-XOLAIR-treated patients (13.0) [see Adverse Reactions (6)]. However, study limitations preclude definitively ruling out a malignancy risk with XOLAIR. Study limitations include: the observational study design, the bias introduced by allowing enrollment of patients previously exposed to XOLAIR (88%), enrollment of patients (56%) while a history of cancer or a premalignant condition were study exclusion criteria, and the high study discontinuation rate (44%). In rare cases, patients with asthma on therapy with XOLAIR may present with serious systemic eosinophilia sometimes presenting with clinical features of vasculitis consistent with Churg-Strauss syndrome, a condition which is often treated with systemic corticosteroid therapy. These events usually, but not always, have been associated with the reduction of oral corticosteroid therapy. Physicians should be alert to eosinophilia, vasculitic rash, worsening pulmonary symptoms, cardiac complications, and/or neuropathy presenting in their patients. A causal association between XOLAIR and these underlying conditions has not been established. In post-approval use, some patients have experienced a constellation of signs and symptoms including arthritis/arthralgia, rash, fever and lymphadenopathy with an onset 1 to 5 days after the first or subsequent injections of XOLAIR. These signs and symptoms have recurred after additional doses in some patients. Although circulating immune complexes or a skin biopsy consistent with a Type III reaction were not seen with these cases, these signs and symptoms are similar to those seen in patients with serum sickness. Physicians should stop XOLAIR if a patient develops this constellation of signs and symptoms [see Adverse Reactions (6.3)]. In a one-year clinical trial conducted in Brazil in adult and adolescent patients at high risk for geohelminthic infections (roundworm, hookworm, whipworm, threadworm), 53% (36/68) of XOLAIR-treated patients experienced an infection, as diagnosed by standard stool examination, compared to 42% (29/69) of placebo controls. The point estimate of the odds ratio for infection was 1.96, with a 95% confidence interval (0.88, 4.36) indicating that in this study a patient who had an infection was anywhere from 0.88 to 4.36 times as likely to have received XOLAIR than a patient who did not have an infection. Response to appropriate anti-geohelminth treatment of infection as measured by stool egg counts was not different between treatment groups. Serum total IgE levels increase following administration of XOLAIR due to formation of XOLAIR:IgE complexes [see Clinical Pharmacology (12.2)]. Elevated serum total IgE levels may persist for up to 1 year following discontinuation of XOLAIR. Do not use serum total IgE levels obtained less than 1 year following discontinuation to reassess the dosing regimen for asthma patients, because these levels may not reflect steady state free IgE levels [see Dosage and Administration (2.1)]. The data described below reflect XOLAIR exposure for 2076 adult and adolescent patients ages 12 and older, including 1687 patients exposed for six months and 555 exposed for one year or more, in either placebo-controlled or other controlled asthma studies. The mean age of patients receiving XOLAIR was 42 years, with 134 patients 65 years of age or older; 60% were women, and 85% Caucasian. Patients received XOLAIR 150 mg to 375 mg every 2 or 4 weeks or, for patients assigned to control groups, standard therapy with or without a placebo. The adverse events most frequently resulting in clinical intervention (e.g., discontinuation of XOLAIR, or the need for concomitant medication to treat an adverse event) were injection site reaction (45%), viral infections (23%), upper respiratory tract infection (20%), sinusitis (16%), headache (15%), and pharyngitis (11%). These events were observed at similar rates in XOLAIR-treated patients and control patients. Table 5 shows adverse reactions from four placebo-controlled asthma trials that occurred ≥1% and more frequently in adult and adolescent patients 12 years of age and older receiving XOLAIR than in those receiving placebo. Adverse events were classified using preferred terms from the International Medical Nomenclature (IMN) dictionary. Injection site reactions were recorded separately from the reporting of other adverse events. There were no differences in the incidence of adverse reactions based on age (among patients under 65), gender or race. A retrospective case-control study investigated risk factors for anaphylaxis to XOLAIR among patients treated with XOLAIR for asthma. Cases with an adjudicated history of anaphylaxis to XOLAIR were compared to controls with no such history. The study found that a self-reported history of anaphylaxis to foods, medications or other causes was more common among patients with XOLAIR anaphylaxis (57% of 30 cases) compared to controls (23% of 88 controls) [OR 8.1, 95% CI 2.7 to 24.3]. Because this is a case-control study, the study cannot provide the incidence of anaphylaxis among XOLAIR users. From other sources, anaphylaxis to XOLAIR was observed in 0.1% of patients in clinical trials and at least 0.2% of patients based upon postmarketing reports [see Warnings and Precautions (5.1), Adverse Reactions (6.3)]. In adults and adolescents, injection site reactions of any severity occurred at a rate of 45% in XOLAIR-treated patients compared with 43% in placebo-treated patients. The types of injection site reactions included: bruising, redness, warmth, burning, stinging, itching, hive formation, pain, indurations, mass, and inflammation. Severe injection site reactions occurred more frequently in XOLAIR-treated patients compared with patients in the placebo group (12% versus 9%). The majority of injection site reactions occurred within 1 hour post injection, lasted less than 8 days, and generally decreased in frequency at subsequent dosing visits. The data described below reflect XOLAIR exposure for 926 patients 6 to <12 years of age, including 583 patients exposed for six months and 292 exposed for one year or more, in either placebo-controlled or other controlled asthma studies. The mean age of pediatric patients receiving XOLAIR was 8.8 years; 69% were male, and 64% were Caucasian. Pediatric patients received XOLAIR 75 mg to 375 mg every 2 or 4 weeks or, for patients assigned to control groups, standard therapy with or without a placebo. No cases of malignancy were reported in patients treated with XOLAIR in these trials. The most common adverse reactions occurring at ≥3% in the pediatric patients receiving XOLAIR and more frequently than in patients treated with placebo were nasopharyngitis, headache, pyrexia, upper abdominal pain, pharyngitis streptococcal, otitis media, viral gastroenteritis, arthropod bite, and epistaxis. The adverse events most frequently resulting in clinical intervention (e.g., discontinuation of XOLAIR, or the need for concomitant medication to treat an adverse event) were bronchitis (0.2%), headache (0.2%) and urticaria (0.2%). These events were observed at similar rates in XOLAIR-treated patients and control patients. The safety of XOLAIR for the treatment of CIU was assessed in three placebo-controlled, multiple-dose clinical trials of 12 weeks' (CIU Trial 2) and 24 weeks' duration (CIU Trials 1 and 3). In CIU Trials 1 and 2, patients received XOLAIR 75 mg, 150 mg, or 300 mg or placebo every 4 weeks in addition to their baseline level of H1 antihistamine therapy throughout the treatment period. In CIU Trial 3 patients were randomized to XOLAIR 300 mg or placebo every 4 weeks in addition to their baseline level of H1 antihistamine therapy. The data described below reflect XOLAIR exposure for 733 patients enrolled and receiving at least one dose of XOLAIR in the three clinical trials, including 684 patients exposed for 12 weeks and 427 exposed for 24 weeks. The mean age of patients receiving XOLAIR 300 mg was 43 years, 75% were women, and 89% were white. The demographic profiles for patients receiving XOLAIR 150 mg and 75 mg were similar. Table 6 shows adverse reactions that occurred in ≥2% of patients receiving XOLAIR (150 or 300 mg) and more frequently than those receiving placebo. Adverse reactions are pooled from Trial 2 and the first 12 weeks of Trials 1 and 3. Additional reactions reported during the 24-week treatment period in Trials 1 and 3 [≥2% of patients receiving XOLAIR (150 mg or 300 mg) and more frequently than those receiving placebo] included: toothache, fungal infection, urinary tract infection, myalgia, pain in extremity, musculoskeletal pain, peripheral edema, pyrexia, migraine, sinus headache, anxiety, oropharyngeal pain, asthma, urticaria, and alopecia. Injection site reactions of any severity occurred during the studies in more XOLAIR-treated patients [11 patients (2.7%) at 300 mg, 1 patient (0.6%) at 150 mg] compared with 2 placebo-treated patients (0.8%). The types of injection site reactions included: swelling, erythema, pain, bruising, itching, bleeding and urticaria. None of the events resulted in study discontinuation or treatment interruption. A 5-year observational cohort study was conducted in patients ≥12 years of age with moderate to severe persistent asthma and a positive skin test reaction to a perennial aeroallergen to evaluate the long term safety of XOLAIR, including the risk of malignancy [see Warnings and Precautions (5.2)]. A total of 5007 XOLAIR-treated and 2829 non-XOLAIR-treated patients enrolled in the study. Similar percentages of patients in both cohorts were current (5%) or former smokers (29%). Patients had a mean age of 45 years and were followed for a mean of 3.7 years. More XOLAIR-treated patients were diagnosed with severe asthma (50%) compared to the non-XOLAIR-treated patients (23%) and 44% of patients prematurely discontinued the study. Additionally, 88% of patients in the XOLAIR-treated cohort had been previously exposed to XOLAIR for a mean of 8 months. A higher incidence rate (per 1000 patient-years) of overall cardiovascular and cerebrovascular serious adverse events (SAEs) was observed in XOLAIR-treated patients (13.4) compared to non-XOLAIR-treated patients (8.1). Increases in rates were observed for transient ischemic attack (0.7 versus 0.1), myocardial infarction (2.1 versus 0.8), pulmonary hypertension (0.5 versus 0), pulmonary embolism/venous thrombosis (3.2 versus 1.5), and unstable angina (2.2 versus 1.4), while the rates observed for ischemic stroke and cardiovascular death were similar among both study cohorts. The results suggest a potential increased risk of serious cardiovascular and cerebrovascular events in patients treated with XOLAIR. However, the observational study design, the inclusion of patients previously exposed to XOLAIR (88%), baseline imbalances in cardiovascular risk factors between the treatment groups, an inability to adjust for unmeasured risk factors, and the high study discontinuation rate limit the ability to quantify the magnitude of the risk. A pooled analysis of 25 randomized double-blind, placebo-controlled clinical trials of 8 to 52 weeks in duration was conducted to further evaluate the imbalance in cardiovascular and cerebrovascular SAEs noted in the above observational cohort study. A total of 3342 XOLAIR-treated patients and 2895 placebo-treated patients were included in the pooled analysis. The patients had a mean age of 38 years, and were followed for a mean duration of 6.8 months. No notable imbalances were observed in the rates of cardiovascular and cerebrovascular SAEs listed above. However, the results of the pooled analysis were based on a low number of events, slightly younger patients, and shorter duration of follow-up than the observational cohort study; therefore, the results are insufficient to confirm or reject the findings noted in the observational cohort study. Antibodies to XOLAIR were detected in approximately 1/1723 (<0.1%) of patients treated with XOLAIR in the clinical studies evaluated for approval of asthma in patients 12 years of age and older. In three pediatric studies, antibodies to XOLAIR were detected in one patient out of 581 patients 6 to <12 years of age treated with XOLAIR and evaluated for antibodies. There were no detectable antibodies in the patients treated in the phase 3 CIU clinical trials, but due to levels of XOLAIR at the time of anti-therapeutic antibody sampling and missing samples for some patients, antibodies to XOLAIR could only have been determined in 88% of the 733 patients treated in these clinical studies. The data reflect the percentage of patients whose test results were considered positive for antibodies to XOLAIR in ELISA assays and are highly dependent on the sensitivity and specificity of the assays. The following adverse reactions have been identified during post-approval use of XOLAIR in adult and adolescent patients 12 years of age and older. Because these reactions are reported voluntarily from a population of uncertain size, it is not always possible to reliably estimate their frequency or establish a causal relationship to drug exposure. Anaphylaxis: Based on spontaneous reports and an estimated exposure of about 57,300 patients from June 2003 through December 2006, the frequency of anaphylaxis attributed to XOLAIR use was estimated to be at least 0.2% of patients. Diagnostic criteria of anaphylaxis were skin or mucosal tissue involvement, and, either airway compromise, and/or reduced blood pressure with or without associated symptoms, and a temporal relationship to XOLAIR administration with no other identifiable cause. Signs and symptoms in these reported cases included bronchospasm, hypotension, syncope, urticaria, angioedema of the throat or tongue, dyspnea, cough, chest tightness, and/or cutaneous angioedema. Pulmonary involvement was reported in 89% of the cases. Hypotension or syncope was reported in 14% of cases. Fifteen percent of the reported cases resulted in hospitalization. A previous history of anaphylaxis unrelated to XOLAIR was reported in 24% of the cases. Of the reported cases of anaphylaxis attributed to XOLAIR, 39% occurred with the first dose, 19% occurred with the second dose, 10% occurred with the third dose, and the rest after subsequent doses. One case occurred after 39 doses (after 19 months of continuous therapy, anaphylaxis occurred when treatment was restarted following a 3-month gap). The time to onset of anaphylaxis in these cases was up to 30 minutes in 35%, greater than 30 and up to 60 minutes in 16%, greater than 60 and up to 90 minutes in 2%, greater than 90 and up to 120 minutes in 6%, greater than 2 hours and up to 6 hours in 5%, greater than 6 hours and up to 12 hours in 14%, greater than 12 hours and up to 24 hours in 8%, and greater than 24 hours and up to 4 days in 5%. In 9% of cases the times to onset were unknown. Twenty-three patients who experienced anaphylaxis were rechallenged with XOLAIR and 18 patients had a recurrence of similar symptoms of anaphylaxis. In addition, anaphylaxis occurred upon rechallenge with XOLAIR in 4 patients who previously experienced urticaria only. Eosinophilic Conditions: Eosinophilic conditions have been reported [see Warnings and Precautions (5.5)]. Fever, Arthralgia, and Rash: A constellation of signs and symptoms including arthritis/arthralgia, rash (urticaria or other forms), fever and lymphadenopathy similar to serum sickness have been reported in post-approval use of XOLAIR [see Warnings and Precautions (5.6)]. Hematologic: Severe thrombocytopenia has been reported. Skin: Hair loss has been reported. No formal drug interaction studies have been performed with XOLAIR. In patients with asthma the concomitant use of XOLAIR and allergen immunotherapy has not been evaluated. In patients with CIU the use of XOLAIR in combination with immunosuppressive therapies has not been studied. The data with XOLAIR use in pregnant women are insufficient to inform on drug associated risk. Monoclonal antibodies, such as omalizumab, are transported across the placenta in a linear fashion as pregnancy progresses; therefore, potential effects on a fetus are likely to be greater during the second and third trimesters of pregnancy. In animal reproduction studies, no evidence of fetal harm was observed in Cynomolgus monkeys with subcutaneous doses of omalizumab up to approximately 10 times the maximum recommended human dose (MRHD) [see Animal Data]. In the US general population the estimated background risk of major birth defects and miscarriage in clinically recognized pregnancies is 2% to 4% and 15% to 20%, respectively. Reproductive studies have been performed in Cynomolgus monkeys. There was no evidence of maternal toxicity, embryotoxicity, or teratogenicity when omalizumab was administered throughout the period of organogenesis at doses that produced exposures approximately 10 times the MHRD (on a mg/kg basis with maternal subcutaneous doses up to 75 mg/kg/week). Omalizumab did not elicit adverse effects on fetal or neonatal growth when administered throughout late gestation, delivery, and nursing. There is no information regarding the presence of omalizumab in human milk, the effects on the breastfed infant, or the effects on milk production. However, omalizumab is a human monoclonal antibody (IgG1 kappa), and immunoglobulin (IgG) is present in human milk in small amounts. In Cynomolgus monkeys, neonatal serum levels of omalizumab after in utero exposure and 28 days of nursing were between 11% and 94% of the maternal serum level. Levels of omalizumab in milk were 0.15% of maternal serum concentration. The developmental and health benefits of breastfeeding should be considered along with the mother's clinical need for XOLAIR and any potential adverse effects on the breastfed child from omalizumab or from the underlying maternal condition. Safety and efficacy of XOLAIR for asthma were evaluated in 2 trials in 926 (XOLAIR 624; placebo 302) pediatric patients 6 to <12 years of age with moderate to severe persistent asthma who had a positive skin test or in vitro reactivity to a perennial aeroallergen. One trial was a pivotal trial of similar design and conduct to that of adult and adolescent Asthma Trials 1 and 2. The other trial was primarily a safety study and included evaluation of efficacy as a secondary outcome. In the pivotal trial, XOLAIR-treated patients had a statistically significant reduction in the rate of exacerbations (exacerbation was defined as worsening of asthma that required treatment with systemic corticosteroids or a doubling of the baseline ICS dose) [see Clinical Studies (14.1)]. Safety and efficacy in pediatric patients with asthma below 6 years of age have not been established. The safety and effectiveness of XOLAIR for adolescent patients with CIU were evaluated in 39 patients 12 to 17 years of age (XOLAIR 29, placebo 10) included in three randomized, placebo-controlled CIU trials. A numerical decrease in weekly itch score was observed, and adverse reactions were similar to those reported in patients 18 years and older. Safety and efficacy in pediatric patients with CIU below 12 years of age have not been established. In clinical studies 134 asthma patients and 37 CIU phase 3 study patients 65 years of age or older were treated with XOLAIR. Although there were no apparent age-related differences observed in these studies, the number of patients aged 65 and over is not sufficient to determine whether they respond differently from younger patients. The maximum tolerated dose of XOLAIR has not been determined. Single intravenous doses of up to 4,000 mg have been administered to patients without evidence of dose limiting toxicities. The highest cumulative dose administered to patients was 44,000 mg over a 20-week period, which was not associated with toxicities. Omalizumab is a recombinant DNA-derived humanized IgG1κ monoclonal antibody that selectively binds to human immunoglobulin E (IgE). The antibody has a molecular weight of approximately 149 kiloDaltons. XOLAIR is produced by a Chinese hamster ovary cell suspension culture in a nutrient medium that may contain the antibiotic gentamicin. Gentamicin is not detectable in the final product. XOLAIR (omalizumab) is administered as a subcutaneous (SC) injection and is available in prefilled syringes and in vials. XOLAIR (omalizumab) injection is supplied as a sterile, preservative-free, clear to slightly opalescent and colorless to pale brownish-yellow solution for subcutaneous injection. XOLAIR (omalizumab) injection is available as a single-dose prefilled syringe. Each 75 mg prefilled syringe delivers 75 mg omalizumab in 0.5 mL and contains L-arginine hydrochloride (21.05 mg), L-histidine (0.68 mg), L-histidine hydrochloride monohydrate (1.17 mg), and polysorbate 20 (0.2 mg) in Sterile Water for Injection (SWFI), USP. Each 150 mg prefilled syringe delivers 150 mg omalizumab in 1 mL and contains L-arginine hydrochloride (42.1 mg), L-histidine (1.37 mg), L-histidine hydrochloride monohydrate (2.34 mg), and polysorbate 20 (0.4 mg) in SWFI, USP. The needle cap contains a derivative of natural rubber latex which may cause allergic reactions in latex sensitive individuals. XOLAIR (omalizumab) for injection is a sterile, white, preservative free, lyophilized powder in a single-dose vial. After reconstitution with 1.4 mL of Sterile Water for Injection, USP, the vial contains 150 mg of omalizumab per 1.2 mL of reconstituted solution for subcutaneous injection. Each 1.2 mL of reconstituted solution also contains L-histidine (1.3 mg), L-histidine hydrochloride monohydrate (2.1 mg), polysorbate 20 (0.4 mg) and sucrose (108 mg). Omalizumab inhibits the binding of IgE to the high-affinity IgE receptor (FcεRI) on the surface of mast cells and basophils. Reduction in surface-bound IgE on FcεRI-bearing cells limits the degree of release of mediators of the allergic response. Treatment with XOLAIR also reduces the number of FcεRI receptors on basophils in atopic patients. Omalizumab binds to IgE and lowers free IgE levels. Subsequently, IgE receptors (FcεRI) on cells down-regulate. The mechanism by which these effects of omalizumab result in an improvement of CIU symptoms is unknown. In clinical studies, serum free IgE levels were reduced in a dose dependent manner within 1 hour following the first dose and maintained between doses. Mean serum free IgE decrease was greater than 96% using recommended doses. Serum total IgE levels (i.e., bound and unbound) increased after the first dose due to the formation of omalizumab:IgE complexes, which have a slower elimination rate compared with free IgE. At 16 weeks after the first dose, average serum total IgE levels were five-fold higher compared with pre-treatment when using standard assays. After discontinuation of XOLAIR dosing, the XOLAIR-induced increase in total IgE and decrease in free IgE were reversible, with no observed rebound in IgE levels after drug washout. Total IgE levels did not return to pre-treatment levels for up to one year after discontinuation of XOLAIR. In clinical studies in CIU patients, XOLAIR treatment led to a dose-dependent reduction of serum free IgE and an increase of serum total IgE levels, similar to the observations in asthma patients. Maximum suppression of free IgE was observed 3 days following the first subcutaneous dose. After repeat dosing once every 4 weeks, predose serum free IgE levels remained stable between 12 and 24 weeks of treatment. Total IgE levels in serum increased after the first dose due to the formation of omalizumab-IgE complexes which have a slower elimination rate compared with free IgE. After repeat dosing once every 4 weeks at 75 mg up to 300 mg, average predose serum total IgE levels at Week 12 were two- to three-fold higher compared with pre-treatment levels, and remained stable between 12 and 24 weeks of treatment. After discontinuation of XOLAIR dosing, free IgE levels increased and total IgE levels decreased towards pre-treatment levels over a 16-week follow-up period. After SC administration, omalizumab was absorbed with an average absolute bioavailability of 62%. Following a single SC dose in adult and adolescent patients with asthma, omalizumab was absorbed slowly, reaching peak serum concentrations after an average of 7–8 days. In patients with CIU, the peak serum concentration was reached at a similar time after a single SC dose. 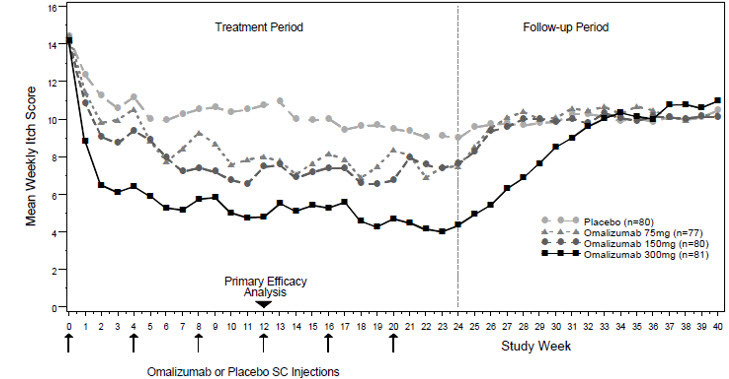 The pharmacokinetics of omalizumab was linear at doses greater than 0.5 mg/kg. In patients with asthma, following multiple doses of XOLAIR, areas under the serum concentration-time curve from Day 0 to Day 14 at steady state were up to 6-fold of those after the first dose. In patients with CIU, omalizumab exhibited linear pharmacokinetics across the dose range of 75 mg to 600 mg given as single subcutaneous dose. Following repeat dosing from 75 to 300 mg every 4 weeks, trough serum concentrations of omalizumab increased proportionally with the dose levels. In vitro, omalizumab formed complexes of limited size with IgE. Precipitating complexes and complexes larger than 1 million daltons in molecular weight were not observed in vitro or in vivo. Tissue distribution studies in Cynomolgus monkeys showed no specific uptake of 125I-omalizumab by any organ or tissue. The apparent volume of distribution of omalizumab in patients with asthma following SC administration was 78 ± 32 mL/kg. In patients with CIU, based on population pharmacokinetics, distribution of omalizumab was similar to that in patients with asthma. Clearance of omalizumab involved IgG clearance processes as well as clearance via specific binding and complex formation with its target ligand, IgE. Liver elimination of IgG included degradation in the liver reticuloendothelial system (RES) and endothelial cells. Intact IgG was also excreted in bile. In studies with mice and monkeys, omalizumab:IgE complexes were eliminated by interactions with Fcγ receptors within the RES at rates that were generally faster than IgG clearance. In asthma patients omalizumab serum elimination half-life averaged 26 days, with apparent clearance averaging 2.4 ± 1.1 mL/kg/day. Doubling body weight approximately doubled apparent clearance. In CIU patients, at steady state, based on population pharmacokinetics, omalizumab serum elimination half-life averaged 24 days and apparent clearance averaged 240 mL/day (corresponding to 3.0 mL/kg/day for an 80 kg patient). The population pharmacokinetics of omalizumab was analyzed to evaluate the effects of demographic characteristics in patients with asthma. Analyses of these data suggested that no dose adjustments are necessary for age (6–76 years), race, ethnicity, or gender. The population pharmacokinetics of omalizumab was analyzed to evaluate the effects of demographic characteristics and other factors on omalizumab exposure in patients with CIU. Covariate effects were evaluated by analyzing the relationship between omalizumab concentrations and clinical responses. These analyses demonstrate that no dose adjustments are necessary for age (12 to 75 years), race/ethnicity, gender, body weight, body mass index or baseline IgE level. No long-term studies have been performed in animals to evaluate the carcinogenic potential of XOLAIR. There were no effects on fertility and reproductive performance in male and female Cynomolgus monkeys that received XOLAIR at subcutaneous doses up to 75 mg/kg/week (approximately 10 times the maximum recommended human dose on a mg/kg basis). The safety and efficacy of XOLAIR were evaluated in three randomized, double-blind, placebo-controlled, multicenter trials. The trials enrolled patients 12 to 76 years old, with moderate to severe persistent (NHLBI criteria) asthma for at least one year, and a positive skin test reaction to a perennial aeroallergen. In all trials, XOLAIR dosing was based on body weight and baseline serum total IgE concentration. All patients were required to have a baseline IgE between 30 and 700 IU/mL and body weight not more than 150 kg. Patients were treated according to a dosing table to administer at least 0.016 mg/kg/IU (IgE/mL) of XOLAIR or a matching volume of placebo over each 4-week period. 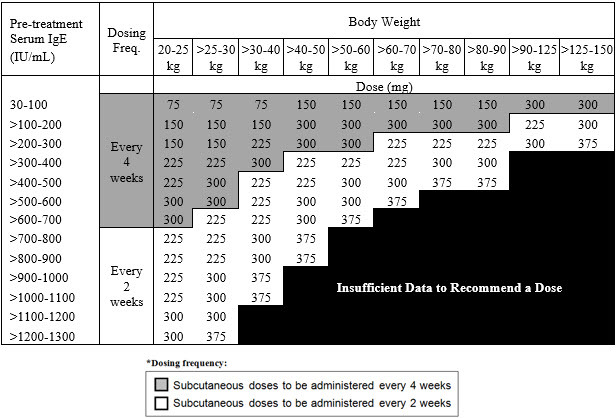 The maximum XOLAIR dose per 4 weeks was 750 mg. In all three trials an exacerbation was defined as a worsening of asthma that required treatment with systemic corticosteroids or a doubling of the baseline ICS dose. Most exacerbations were managed in the outpatient setting and the majority were treated with systemic steroids. Hospitalization rates were not significantly different between XOLAIR and placebo-treated patients; however, the overall hospitalization rate was small. Among those patients who experienced an exacerbation, the distribution of exacerbation severity was similar between treatment groups. At screening, patients in Asthma Trials 1 and 2 had a forced expiratory volume in one second (FEV1) between 40% and 80% predicted. All patients had a FEV1 improvement of at least 12% following beta2-agonist administration. All patients were symptomatic and were being treated with inhaled corticosteroids (ICS) and short acting beta2-agonists. Patients receiving other concomitant controller medications were excluded, and initiation of additional controller medications while on study was prohibited. Patients currently smoking were excluded. Each trial was comprised of a run-in period to achieve a stable conversion to a common ICS (beclomethasone dipropionate), followed by randomization to XOLAIR or placebo. Patients received XOLAIR for 16 weeks with an unchanged corticosteroid dose unless an acute exacerbation necessitated an increase. Patients then entered an ICS reduction phase of 12 weeks during which ICS dose reduction was attempted in a step-wise manner. The distribution of the number of asthma exacerbations per patient in each group during a study was analyzed separately for the stable steroid and steroid-reduction periods. In both Asthma Trials 1 and 2 the number of exacerbations per patient was reduced in patients treated with XOLAIR compared with placebo (Table 7). Measures of airflow (FEV1) and asthma symptoms were also evaluated in these trials. The clinical relevance of the treatment-associated differences is unknown. Results from the stable steroid phase Asthma Trial 1 are shown in Table 8. Results from the stable steroid phase of Asthma Trial 2 and the steroid reduction phases of both Asthma Trials 1 and 2 were similar to those presented in Table 8. Asthma symptom scale: total score from 0 (least) to 9 (most); nocturnal and daytime scores from 0 (least) to 4 (most symptoms). Number of patients available for analysis ranges 255-258 in the XOLAIR group and 238-239 in the placebo group. Comparison of XOLAIR versus placebo (p < 0.05). In Asthma Trial 3, there was no restriction on screening FEV1, and unlike Asthma Trials 1 and 2, long-acting beta2-agonists were allowed. Patients were receiving at least 1000 µg/day fluticasone propionate and a subset was also receiving oral corticosteroids. Patients receiving other concomitant controller medications were excluded, and initiation of additional controller medications while on study was prohibited. Patients currently smoking were excluded. The trial was comprised of a run-in period to achieve a stable conversion to a common ICS (fluticasone propionate), followed by randomization to XOLAIR or placebo. Patients were stratified by use of ICS-only or ICS with concomitant use of oral steroids. Patients received XOLAIR for 16 weeks with an unchanged corticosteroid dose unless an acute exacerbation necessitated an increase. Patients then entered an ICS reduction phase of 16 weeks during which ICS or oral steroid dose reduction was attempted in a step-wise manner. The number of exacerbations in patients treated with XOLAIR was similar to that in placebo-treated patients (Table 9). The absence of an observed treatment effect may be related to differences in the patient population compared with Asthma Trials 1 and 2, study sample size, or other factors. In all three of the trials, a reduction of asthma exacerbations was not observed in the XOLAIR-treated patients who had FEV1>80% at the time of randomization. Reductions in exacerbations were not seen in patients who required oral steroids as maintenance therapy. The safety and efficacy of XOLAIR in pediatric patients 6 to <12 years of age with moderate to severe asthma is based on one randomized, double-blind, placebo controlled, multi-center trial (Trial 4) and an additional supportive study (Trial 5). Trial 4 was a 52-week study that evaluated the safety and efficacy of XOLAIR as add-on therapy in 628 pediatric patients ages 6 to <12 years with moderate to severe asthma inadequately controlled despite the use of inhaled corticosteroids (fluticasone propionate DPI ≥200 mcg/day or equivalent) with or without other controller asthma medications. Eligible patients were those with a diagnosis of asthma >1 year, a positive skin prick test to at least one perennial aeroallergen, and a history of clinical features such as daytime and/or night-time symptoms and exacerbations within the year prior to study entry. During the first 24 weeks of treatment, steroid doses remained constant from baseline. This was followed by a 28-week period during which inhaled corticosteroid adjustment was allowed. The primary efficacy variable was the rate of asthma exacerbations during the 24-week, fixed steroid treatment phase. An asthma exacerbation was defined as a worsening of asthma symptoms as judged clinically by the investigator, requiring doubling of the baseline inhaled corticosteroid dose for at least 3 days and/or treatment with rescue systemic (oral or IV) corticosteroids for at least 3 days. At 24 weeks, the XOLAIR group had a statistically significantly lower rate of asthma exacerbations (0.45 vs. 0.64) with an estimated rate ratio of 0.69 (95% CI: 0.53, 0.90). The XOLAIR group also had a lower rate of asthma exacerbations compared to placebo over the full 52-week double-blind treatment period (0.78 vs. 1.36; rate ratio: 0.57; 95% CI: 0.45, 0.72). Other efficacy variables such as nocturnal symptom scores, beta-agonist use, and measures of airflow (FEV1) were not significantly different in XOLAIR-treated patients compared to placebo. Trial 5 was a 28-week randomized, double blind, placebo-controlled study that primarily evaluated safety in 334 pediatric patients, 298 of whom were 6 to <12 years of age, with moderate to severe asthma who were well-controlled with inhaled corticosteroids (beclomethasone dipropionate 168-420 mcg/day). A 16-week steroid treatment period was followed by a 12-week steroid dose reduction period. Patients treated with XOLAIR had fewer asthma exacerbations compared to placebo during both the 16-week fixed steroid treatment period (0.18 vs. 0.32; rate ratio: 0.58; 95% CI: 0.35, 0.96) and the 28-week treatment period (0.38 vs. 0.76; rate ratio: 0.50; 95% CI: 0.36, 0.71). The safety and efficacy of XOLAIR for the treatment of CIU was assessed in two placebo-controlled, multiple-dose clinical trials of 24 weeks' duration (CIU Trial 1; n= 319) and 12 weeks' duration (CIU Trial 2; n=322). Patients received XOLAIR 75 mg, 150 mg, or 300 mg or placebo by SC injection every 4 weeks in addition to their baseline level of H1 antihistamine therapy for 24 or 12 weeks, followed by a 16-week washout observation period. A total of 640 patients (165 males, 475 females) were included for the efficacy analyses. Most patients were white (84%) and the median age was 42 years (range 12–72). Disease severity was measured by a weekly urticaria activity score (UAS7, range 0–42), which is a composite of the weekly itch severity score (range 0–21) and the weekly hive count score (range 0–21). All patients were required to have a UAS7 of ≥16, and a weekly itch severity score of ≥8 for the 7 days prior to randomization, despite having used an H1 antihistamine for at least 2 weeks. The mean weekly itch severity scores at baseline were fairly balanced across treatment groups and ranged between 13.7 and 14.5 despite use of an H1 antihistamine at an approved dose. The reported median durations of CIU at enrollment across treatment groups were between 2.5 and 3.9 years (with an overall subject-level range of 0.5 to 66.4 years). In both CIU Trials 1 and 2, patients who received XOLAIR 150 mg or 300 mg had greater decreases from baseline in weekly itch severity scores and weekly hive count scores than placebo at Week 12. Representative results from CIU Trial 1 are shown (Table 10); similar results were observed in CIU Trial 2. The 75-mg dose did not demonstrate consistent evidence of efficacy and is not approved for use. Modified intent-to-treat (mITT) population: all patients who were randomized and received at least one dose of study medication. The mean weekly itch severity score at each study week by treatment groups is shown in Figure 1. Representative results from CIU Trial 1 are shown; similar results were observed in CIU Trial 2. The appropriate duration of therapy for CIU with XOLAIR has not been determined. In CIU Trial 1, a larger proportion of patients treated with XOLAIR 300 mg (36%) reported no itch and no hives (UAS7=0) at Week 12 compared to patients treated with XOLAIR 150 mg (15%), XOLAIR 75 mg (12%), and placebo group (9%). Similar results were observed in CIU Trial 2. XOLAIR (omalizumab) injection is a clear to slightly opalescent and colorless to pale brownish-yellow solution in a single-dose prefilled glass syringe with a 26 gauge staked needle, rigid needle cap, and needle shield. Each carton contains one prefilled syringe. Each XOLAIR 75 mg carton contains one single-dose 75 mg prefilled syringe with a blue needle shield (NDC 50242-214-01). Each XOLAIR 150 mg carton contains one single-dose 150 mg prefilled syringe with a purple needle shield (NDC 50242-215-01). Do not freeze. Do not use if the syringe has been frozen. XOLAIR is supplied as a lyophilized, white, sterile powder in a single-dose vial without preservatives. Each carton contains one 150 mg single-dose vial of XOLAIR® (omalizumab) for injection NDC 50242-040-62. XOLAIR should be shipped at controlled ambient temperature (≤30°C [≤86°F]). Store XOLAIR under refrigerated conditions 2°C to 8°C (36°F to 46°F) in the original carton. 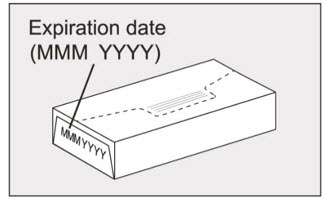 Do not use beyond the expiration date stamped on carton. Provide and instruct patients to read the accompanying Medication Guide before starting treatment and before each subsequent treatment. The complete text of the Medication Guide is reprinted at the end of this document. Instruct patients receiving XOLAIR not to decrease the dose of, or stop taking any other asthma or CIU medications unless otherwise instructed by their physician. Inform patients that they may not see immediate improvement in their asthma or CIU symptoms after beginning XOLAIR therapy. Your healthcare provider will monitor you closely for symptoms of an allergic reaction while you are receiving XOLAIR and for a period of time after your injection. Your healthcare provider should talk to you about getting medical treatment if you have symptoms of an allergic reaction after leaving the healthcare provider's office or treatment center. moderate to severe persistent asthma in patients 6 years of age and older whose asthma symptoms are not controlled by asthma medicines called inhaled corticosteroids. A skin or blood test is performed to see if you have allergies to year-round allergens. Who should not receive XOLAIR? are allergic to omalizumab or any of the ingredients. See the end of this Medication Guide for a complete list of ingredients in XOLAIR. What should I tell my healthcare provider before receiving XOLAIR? XOLAIR should be given by your healthcare provider in a healthcare setting. See "What is the most important information I should know about XOLAIR?" These are not all the possible side effects of XOLAIR. Call your doctor for medical advice about side effects. You may report side effects to FDA at 1-800-FDA-1088. General information about the safe and effective use of XOLAIR. Medicines are sometimes prescribed for purposes other than those listed in a Medication Guide. If you would like more information, talk to your healthcare provider or pharmacist. You can ask your pharmacist or healthcare provider for information about XOLAIR that is written for health professionals. Do not use XOLAIR for a condition for which it was not prescribed. For more information, go to www.xolair.com or call 1-866-4XOLAIR (1-866-496-5247). What are the ingredients in XOLAIR? XOLAIR® is a registered trademark of Novartis AG. ©2018 Genentech USA, Inc. Caution: The needle cap may contain natural rubber latex which may cause allergic reactions in latex sensitive individuals.